Goat's milk cheese is cheese made from milk that came from a goat instead of milk that came from a cow. It has a different color, structure, and taste than that of regular cheese. It is usually white and breaks apart quickly. Because it breaks apart quickly it is usually stored in plastic containers with water. 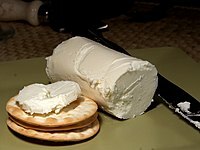 Goat's milk cheese is more common in countries where it is difficult to keep cows. This page was last changed on 10 July 2018, at 10:23.